Cultural influences and personal care needs of consumers continue to shape up the global cosmetics landscape, wherein majority of consumers are seeking solutions to get best skin care treatment at utmost convenience. Consumers from different cultures are preferring to use products that facilitate skin care treatments such as a tanning. Likewise, companies are also actively capitalizing on this trend by offering products that can providing naturally tanned treatment to the skin despite the indoor use. Beiersdorf Aktiengesellschaft, L'Oréal S.A., Avon Products, Inc., Johnson & Johnson Services, Inc., Shiseido Co., Ltd., Kao Corporation, The Estee Lauder Companies Inc., The Procter & Gamble Company, Christian Dior SE., and Unilever PLC are recognized as the leaders in the global production of self tanning products. These companies will continue to deliver new and improved range on self tanning products in the foreseeable future. According to Transparency Market Research’s recently published report, these companies are poised to instrument the global expansion of the self tanning products market. By the end of 2026, the demand for self tanning products is expected to have gained steady traction, amassing global revenues worth nearly US$ 5.5 Bn. The report further reveals that the global self tanning products market will expand steadily at a CAGR of 5.3% during the forecast period, 2017-2026. While the personal needs are slated to drive the demand for self tanning products to a considerable extent, majority of companies are expecting a growing inclination of consumers towards the luxury cosmetic products segment. By using distinct colors, influential odors, and harmless ingredients, companies are expected to manufacture self tanning products that capture the consumer preferences effectively. Moreover, the demand for self tanning products is pegged to be bolstered by growing discomfort faced by people during outdoor tanning sessions and at the hands of professional tanning services. In addition, scientific studies have revealed the role of self tanning products in controlling the incidence of non-melanoma skin cancer, which is generally caused by excessive exposure to UV radiation – a common condition acquired during natural tanning process. The report has further revealed that Europe will register highest demand for self tanning products. Higher inclination of European consumers towards DIY approach will drive the sales of self tanning products in the region. By the end of 2026, the self tanning products market in Europe will be worth over US$ 2.8 Bn. 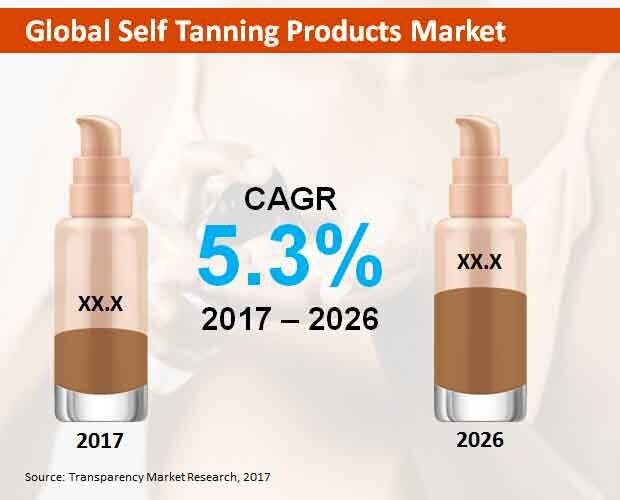 The report also expects North America to be at the forefront of global self tanning products market expansion through 2026.